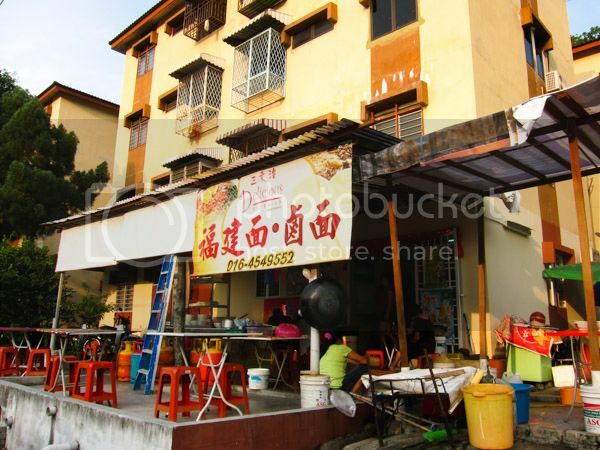 There are abundance of good hokkien mee (prawn mee) in Penang. And they are mostly available during day time, i.e. for breakfast, brunch and lunch. But when it comes to dinner, I hardly know any of it. The one I always go to is at Old Greenhouse at Burma Road. 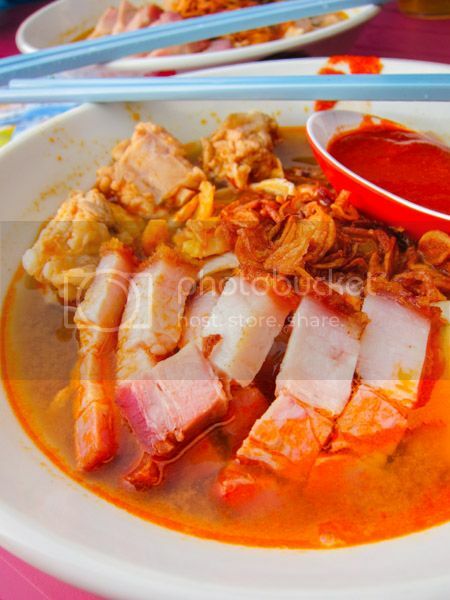 It’s available at night till midnight – pretty good for late night supper. But on my previous holiday in Penang, I found another one which suits my tastebuds. It is quite far from the city and navigating through the heavy traffic in the island calls for much patience. Parking may be proved challenging but we got ours instantly, by the roadside. The stall is located at one of those flats with few tables and chairs decked out al-fresco style with full view of traffic. 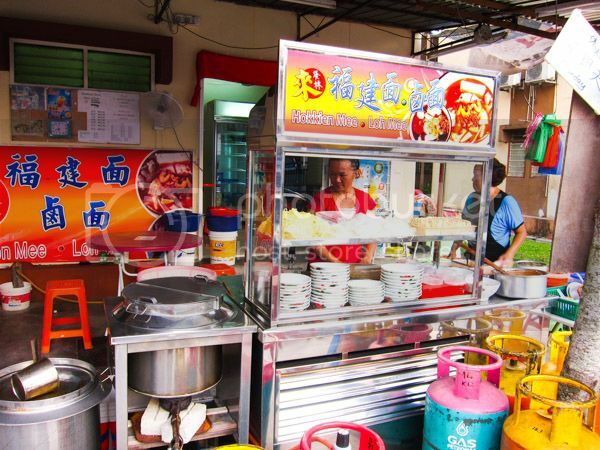 The menu is simple; either hokkien mee or loh mee. There are plenty of add-ons (with surcharges) such as pork ribs, roast pork, pork balls, pork intestines and etc. The list of add-ons is plastered on the wall for easier reference although I think it serves no purpose since most hungry customers know what they gonna order by the time they reached. I ordered mine topped with pork ribs, roast pork and intestines. It came in rather large porcelain bowl with all the works swimming in the fiery hot-looking broth. They’re pretty generous with the ingredients, I would say. The stall owner was more than happy to add more chilli oil to one of the bowls for more oomph. Though it may not be as tasty as the one at Burma Road, this somehow did make the grade. 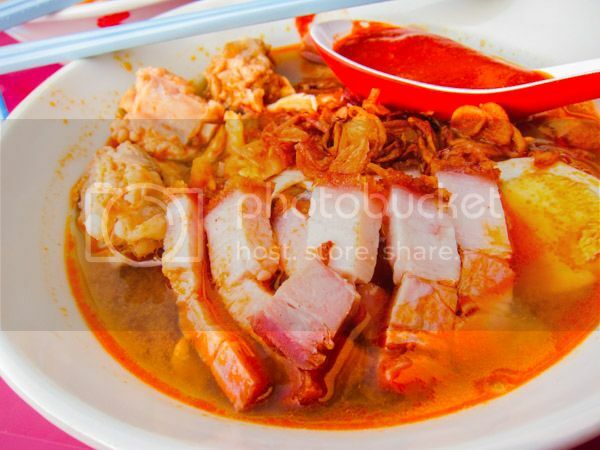 The prawn-infused porky stock was hearty and spicy – though not a tongue-numbing rate. The crispy skin roast pork was good while the pork ribs was tender with its meat fell off easily. I didn’t really like the intestines as they weren’t clean thoroughly. My bowl of noodles costs RM8.50 due to the add-ons. It would be pricey for some, but judging by the ingredients and taste, I would not mind going back again for more!